In Tour de Office 2017, over 1,100 riders raised more than $160,000 for 19 Australian charities. Congratulations to PwC Melbourne who took out the title of Tour de Office Fundraising Champion 2017, having raised $18,995 for the Starlight Children’s Foundation. 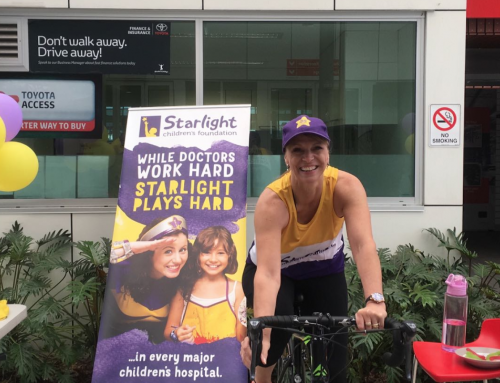 A special mention to Kristy Whitnell who raised from the team who raised $8,100 for Starlight! 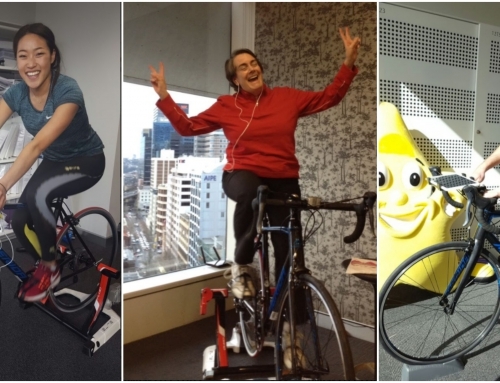 Well done PwC Melbourne – an incredible achievement for their first year riding in Tour de Office. Read on to learn how riders across Australia jumped on the Tour de Office bike for a good cause and had a lot of fun along the way. 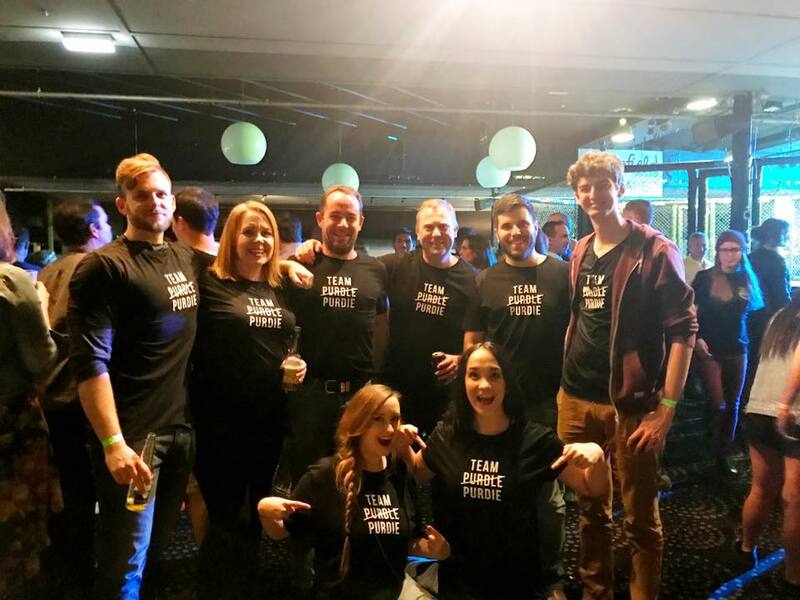 Tour de Office 2017 started strong with many of our hosts in NSW, VIC and WA returning for their second or third year in a row! Ferrier Hodgson, Wodonga Tafe and Commonwealth Bank and KordaMentha Sydney, Melbourne Perth showed us how it’s done – covering over 6,300 km. That’s equal to the distance from Cape York to Perth! The KordaMentha and Commonwealth Bank Perth teams enjoyed a week-long party – with their bike alight with fluorescent lights and the room decorated in colourful balloons. Costume days across NSW and WA brought out the pirates, Simpson’s characters and crazy doctors among the teams. 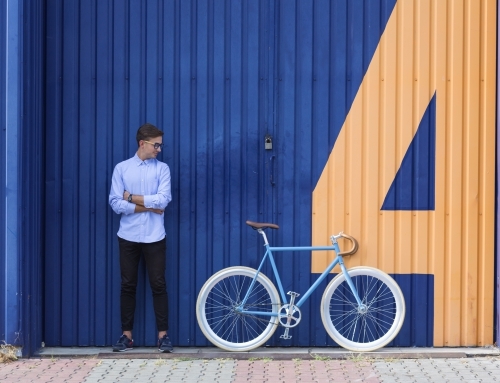 Two bikes set up side-by-side created some extra healthy competition between riders at Commonwealth Bank and KordaMentha Sydney and Melbourne. The Tour de Office September event kept up the almighty pace set by our August hosts. 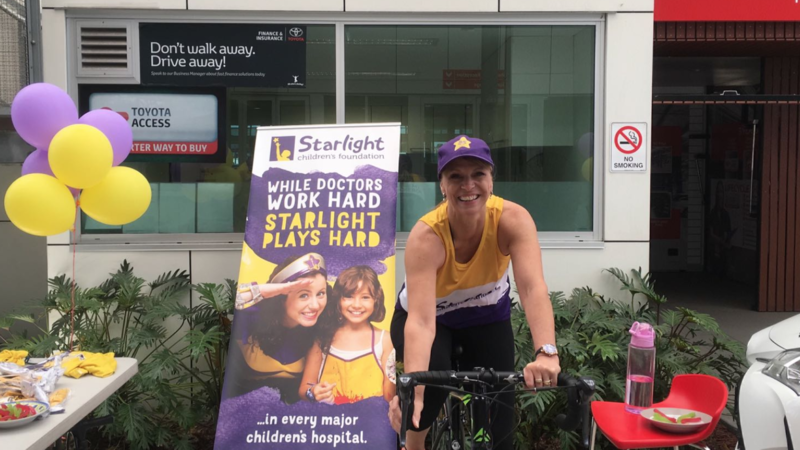 It was fantastic to welcome PwC Melbourne and Brisbane, and Origin Energy Brisbane, who rode in Tour de Office for the first time this year and had an absolute blast fundraising for Starlight and Beacon respectively. 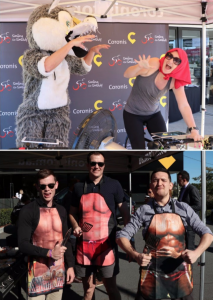 News Corp, Motorama, Employment Office, Staples, Advanced Traders, Optus and Coronis returned to ride in Tour de Office to have a go at smashing their previous fundraising record! September hosts raised a fantastic $98,598. Employment Office Brisbane launched Tour de Office with EO Founding Director Tudor, taking the first ride – coffee in one hand, Chobani yogurt in the other. Needless to say, he didn’t break the record for the most distance covered! The team invited their charity partner to visit – Jaimi, Danny and Craig from Stepping Stone Clubhouse jumped on the bike, giving EO riders a run for their money. 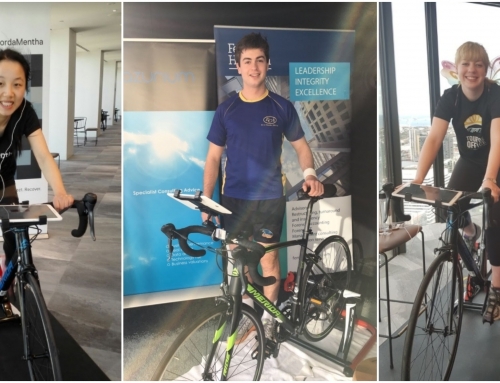 Down in Melbourne, the PwC team loved pedalling overlooking their beautiful city, accompanied by their trusty star – a lovely reminder that all their fundraising dollars would be helping sick kids from the Starlight Children’s Foundation. Meanwhile, the Motorama team shared the bike across their Brisbane dealerships throughout the week, enjoying in the warm sun as they have other years. Staples and Advanced traders put in a fantastic effort, covering a combined distance of 600km. Thank you to our volunteers who kept our rider schedule running smoothly, and most importantly, smiling throughout their ride! If you know someone who would like to volunteer in future events, please direct them to info@tourdeoffice.com. We are always looking for bright and enthusiastic TDO volunteers. Thank you to our sponsors! The wonderful prizes provided by Snackwize and Jason L Furniture and Chobani helped motivate our riders to raise as much for their charity as possible. 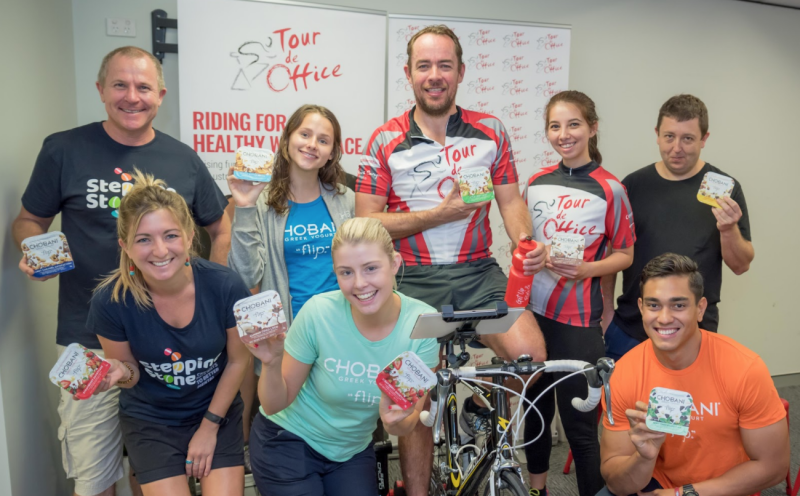 Meanwhile, Chobani flips were spilling out of fridges across Australia for Tour de Office, to be enjoyed by hungry riders for a well-deserved pick-me-up. 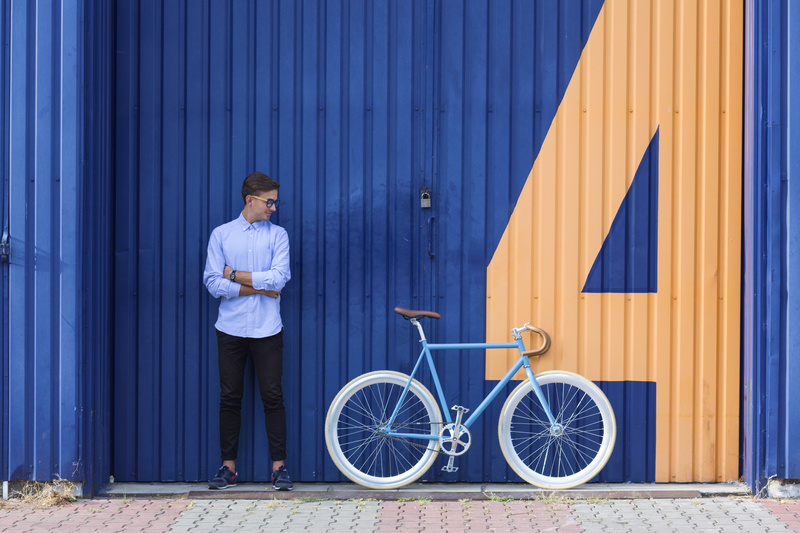 Click to learn more about Tour de Office 2018 or email info@tourdeoffice.com to express your interest in hosting a Tour de Office event.